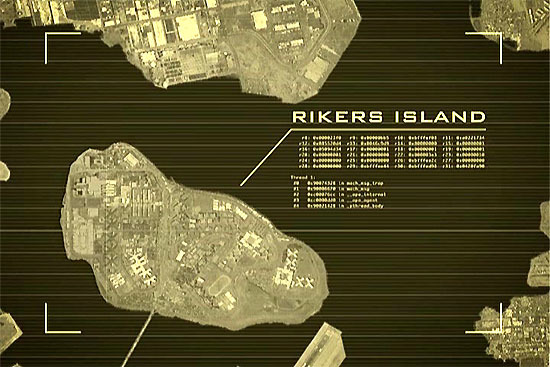 An opening image in the Rikers segment of Jails of New York in the NYCTV Original Productions "Secrets of NY" series was a space satellite photo showing outlines of the island's 10 jails and its position relative to the boroughs. Note bridge linking the island to Queens, even though jurisdictionally Rikers is in the Bronx. Also note the end of a LaGuardia Airport runway jutting into the East River near the island. This and the other views from the Jails of New York show in the "Secrets of NY" series are presented here by NYCHS through courtesy of NYCTV Original Productions that retains and reserves all rights. © 2nd of 35 Rikers Island images from NYCTV Jails of New York show in "Secrets of New York" series. To NYCHS presentation of NYCTV photos of Anton Refregier's Rikers WPA mural.